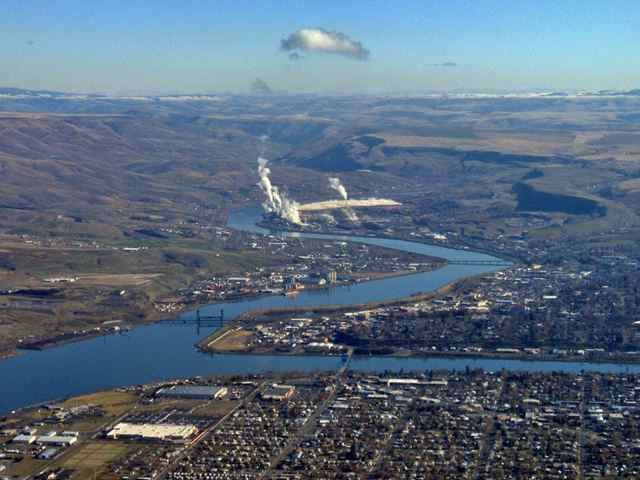 Lewiston is bordered by two powerful and productive rivers, and water has played a pivotal role in its development. But that fact could be lost on visitors as they stroll along Main Street. Gazing west or north, they may see people walking, biking and jogging on elevated pathways, but they won't see the flowing waters of the Snake or Clearwater rivers. "Lewiston is a city on the river, but to me it doesn't feel like it's on the river," said Blake Brooks, a landscape architecture student at Washington State University. "You can be 50 feet from the river standing in downtown with this monolithic levee, and the water is so slow you can't hear it, you can't see it. It's a really interesting disconnect in my opinion." Brooks is one of 10 WSU architecture students tasked with reinventing Lewiston's waterfront for a class centered on the four lower Snake River dams, efforts to recover salmon and steelhead, and how that might affect the city. The levees arrived in the mid-1970s with the completion of Lower Granite Dam, which brought slackwater to Lewiston. The dams made the town into a seaport and increased the amount of hydroelectric power generated in the region. But they also hammered native salmon and steelhead runs, many of which are now protected under the Endangered Species Act. For more than 20 years, the region has been embroiled in a debate about the dams and how best to save the fish. The federal government is in the midst of a multi-year study looking for the best way to proceed. Federal District Court Judge Michael Simon of Portland has dictated that dam breaching must be among the alternatives analyzed. The semester-long course, taught by associate professor Jolie B. Kaytes, began with an overview of the issues surrounding dams and fish. The students studied salmon ecology, navigation and regional economics. They visited lower Granite Dam, the Port of Wilma and the Lewiston Levee Pathway. They ventured up river to view a free-flowing section of the Snake near Buffalo Eddy. They met with farmers and members of the Nez Perce Tribe. Kaytes then asked them to redesign Lewiston's waterfront, with or without the dams in place. "This is a fantastic challenge for landscape architecture students, figuring out a way to make a vital waterfront," she said. Most, if not all, chose a future without dams, but some created designs that could be implemented with either free-flowing or slack water. A common takeaway for the students was breaching would allow the city to regain its connection to its waterfront. Their work was concentrated between the Southway Bridge and the confluence of the two rivers. "With the dams removed, it really gives you an opportunity to reconnect the entire community with the natural processes of the river," student Ian Conrardy said. Many of the designs focus on retaining and expanding community green space along Snake River Avenue in the form of parks and plazas. Students looked dimly on the industrial zoning there and instead chose a mixed-use zone which would allow for pedestrian-friendly boutiques, eateries and recreation-oriented small businesses like kayak and stand-up paddleboard rentals. One student envisioned repurposing barges into floating green spaces. Another pictured an elevated boardwalk above the river near the confluence. Several of the students removed the levees or reduced their size to make beaches, expected to emerge after the dams are breached, more accessible. Some of the designs replaced the levees with lower versions. Others punched passageways through them and included emergency gates that could be closed during flood events. One student would use riprap from the levees to build rapids and a whitewater park. Other designs included piers, docks or sky bridges. The students will present their designs from 4 to 5:30 p.m. Friday at the Lewiston City Library, and their work will stay there through June.